What's New with NBEO® for 2019? New Year, New OptoPrep Fun! Optometrists: We LOVE What We Do! 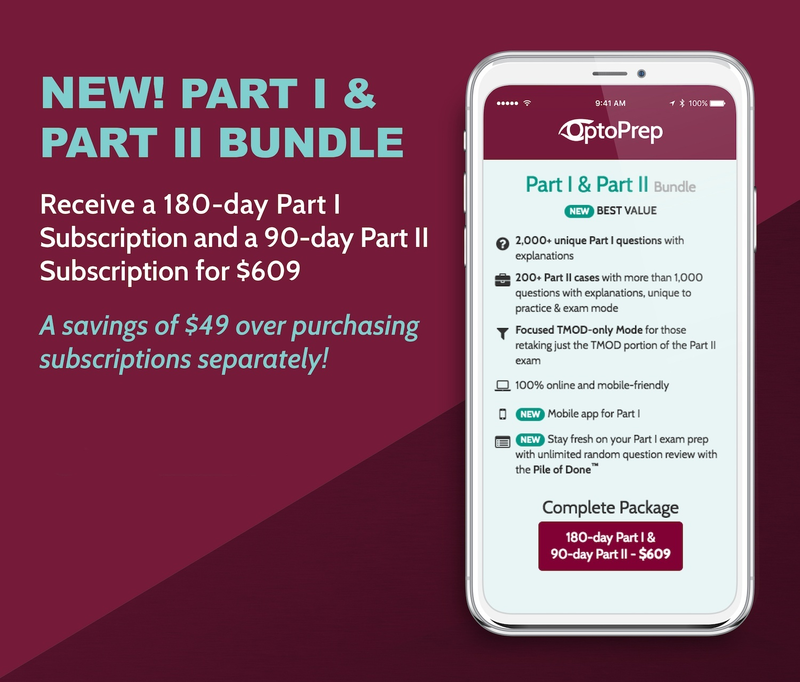 Have You Heard about Our New OptoPrep Bundle Option? Where Do You OptoPrep? Show Us and You Could Win a D-EYE iPhone Retinal Imaging System! Have you heard the news? 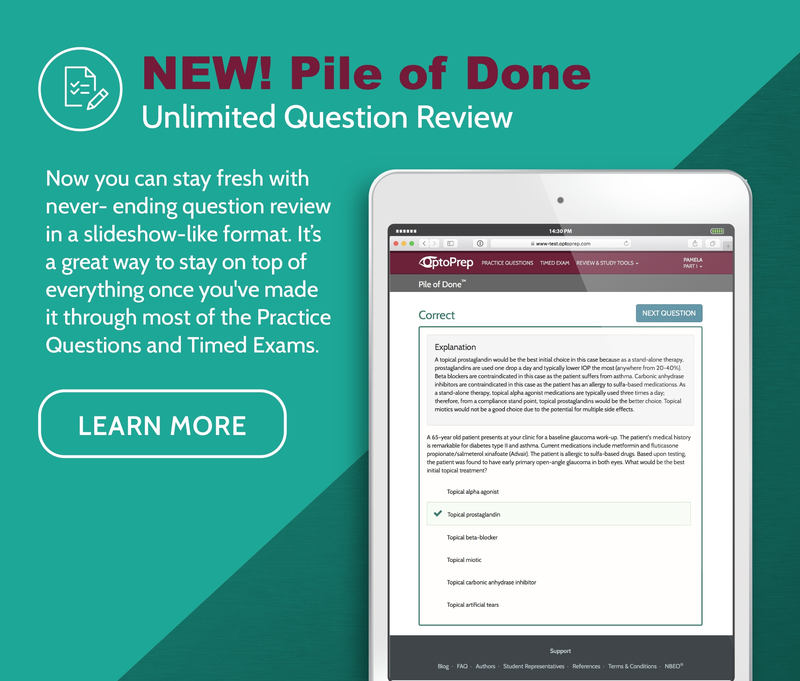 NBEO® preparation just got that much better! Are You Happy With Your Optometry Career Choice? Poll: What are your plans for the summer? Poll: What is the approximate gender breakdown for your class? Be Prepared For Your First 4th Year Rotation! 19 Low-Stress Jobs That Make A Lot Of Money & Guess Who's #1?! How Much Do You Make as an Optometrist? Optometry Student: How much time do you get off for winter break? OD Spotlight: Dr. Viola Kanevsky, O.D. Are you taking NBEO Part 2 this Week? Is a Sustained Medication Delivery System on the Horizon? OD Spotlight: Dr. Robert Meisel, O.D. Visit the OptoPrep Booth at Academy! Poll: Are you planning on attending the American Academy of Optometry meeting in Anaheim? Link: Is That Conjunctival Lesion Cancerous? OD Spotlight: Dr. Alan Glazier, O.D., F.A.A.O. Check Out the New Changes to OptoPrep! Poll: If you could go back in time, would you still go to optometry school? Optometry Student: Do you know what Nd:YAG Stands For? Poll: Do you have a pet with you while in Optometry School? Did You Know This About Eye Muscles? Optometrist Spotlight: Dr. Alicia Feis, O.D., F.A.A.O. Link: Have you all seen this campaign on Indiegogo?! Poll: As an optometry student, what modality of contact lenses do you wear? Quiz: What is the primary action of the inferior oblique muscle? Welcome to Optometry, Class of 2020! Poll: Are you planning to attend Vision Expo West in Las Vegas? Did You Know All Drugs Have 3 Names? Poll: Were you part of the optometry student fraudulent CC breach? Which of the following classifications BEST describes a fasting blood glucose value of 121mg/dL? Poll: How are you spending your summer? Did you know this about the Color "Eigengrau"? OD Spotlight: Dr. Stephanie Woo, O.D., F.A.A.O, F.S.L.S. Poll: Is anyone else in your immediate family an Optometrist? Visit the OptoPrep Booth at Optometry’s Meeting! Link: What Does "Legally Blind" Mean? Poll: Are you planning on attending AOA Optometry's Meeting in Boston? Did you know this about the Cornea of a Shark? Optometry Spotlight: Dr. Jason Tu, O.D. Poll: Which year is the most difficult for an optometry student? Visual Cues: Talk about Man's Best Friend! Which layer of the iris primarily determines its perceived color? FDA Approves Corneal Collagen Cross-linking in the U.S. Poll: Which specialty optometry clinic is your favorite so far? Quick Quiz: What does LASIK Stand For? Poll: Which fundus lens do you prefer to use in clinic? Did You Know that our Iris has over 256 Unique Characteristics? Nip Those Spring Allergies in the Bud! NBEO Part 1 is DONE! Is Your Patient a Good Candidate for LASIK Surgery? NBEO Scores are Out! Now Celebrate! Essential Apps for Optometry: Part 2! NBEO STUDY TOOL: "No Surprises and I was Able to Practice"
Is an Optometry Residency Right for You? Can New Eye Drop Really Clear Cataracts?